30/08/12 - Fundraising drive - Paris, Bibliothèque nationale de France - Museums are now increasing their direct appeals to help in acquiring works. Even if only to provide the final push completing a budget put together by more conventional methods - the museum’s own funds, heritage funds, regional acquisition funds for establishments, business patronage... - these drives have always found contributors, be it in the case of small museums [see Vic-sur-Seille or L’Isle-Adam (see article in French) for example] or large institutions such as the Louvre. 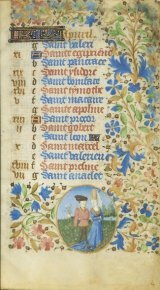 This time, the Bibliothèque nationale is also turning to private individuals to ask for help in purchasing an exceptional illuminated work (ill. 1), the Book of hours of Jeanne de France, the daughter of Charles VII, probably assembled to celebrate her marriage to the Comte de Clermont in 1452. 1. 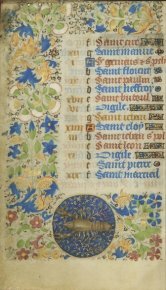 France, Loire Valley, mid-15th c.
each page showing three-quarter borders. Red velvet of later date. This is thus a royal manuscript, made up of 336 sheets decorated with 28 full-page miniatures illustrating the text and 37 smaller ones in the form of narrative medallions including saints, as well as a calendar showing the months’ tasks and the zodiac signs. The ensemble presents borders of green or gilt scrolled foliage. 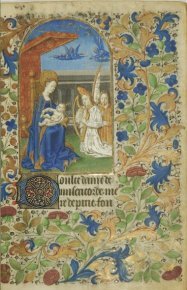 These illuminations, except for perhaps two, are the work of the "Master of Guillaume Jouvenel des Ursins" (ill. 2 to 4), an artist of unknown identity, previously associated with the young Jean Fouquet. Two illuminations, the Nailing to the Cross and the Crucifixion show a style very similar to Fouquet’s although they cannot be attributed to him for sure. According to the opinion of the Commission des trésors nationaux, dated 24 June 2011 : "this luxurious work, probably commissioned by the French king for his daughter and with no other equivalent work held in French public collections, corresponds to one of the most refined productions of court art in the Val de Loire under the reign of Charles VII." It comes from the collection of Victor Prosper Martin Le Roy, inherited by his son-in-law Jean-Joseph Marquet de Vasselot. We should remember that part of this collection was auctioned off by Christie’s last November and that the Louvre and the Musée de Cluny had purchased several objects directly by private agreement negotiated with the help of the British auction house. 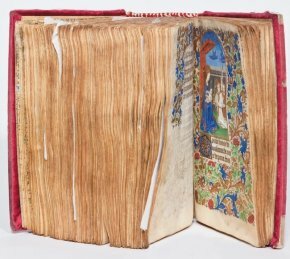 We had pointed out then (see article in French) that three objects, including this book of hours, were listed as national treasures. So far, 750,000 euros of the required 1 million goal have been raised. It would be a shame to miss this opportunity of acquiring a major addition for French collections because of the 250,000 balance still needed. We hope therefore that the fundraising will be successful or, if not, that the French Ministry of Culture will assume the responsibility of completing the sum. We again remind our readers that private individuals benefit from an income tax deduction of 66% of the object’s value (with a cap of 20% of taxable income) and that businesses can deduct 90% of their donation (with a cap of 50% of the company’s tax bill). Surprisingly, the deadline for the fundraiser is end 2012 : normally the ban for export of a national treasure lasts 30 months, which should mean until December 2013.